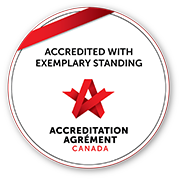 Quinte Healthcare Corporation (QHC) is committed to excellence in serving all customers including people with disabilities. QHC supports the rights of all persons with disabilities to safe and equal access to the facilities, services and programs that are offered by the hospital, in accordance with the Ontarians with Disabilities Act, 2001 and the Accessibility for Ontarians with Disabilities Act., 2005. All persons with disabilities who visit, work for, or use the hospital facilities, services, and properties requiring a personal assistive device will have access to safe and barrier-free environments, programs and services. All electronic devices are to be checked per policy 2.11.26 Corporate - Electrical Equipment Use-Non Medical. Assistive devices:devices that are used by people with disabilities to help with daily living. They include a broad range of products such as wheelchairs, walkers, white canes, oxygen tanks and electronic communication devices that people may bring to the hospital. In fulfilling its mission, QHC strives to provide quality care and meet the needs of those they serve. QHC respects the dignity and independence of people with disabilities. QHC is committed to providing people with disabilities who attend the hospital as a visitor, patient, staff or volunteer the same access to care as those with no disabilities. People will be able to use their personal assistive devices to access our services at QHC. Devices such as TTY text phone devices, telephones and communication amplifiers (Pocket Talkers) will be made available. Services such as sign language interpretation and oral interpretation information available can be provided upon request (Policy # 2.5 American Sign Language (ASL) - Interpretation for the Deaf. Notify area team leader or manager for assistance as required. Wheelchairs and other mobility aides are often available or will become so upon request. Contact the resource centre or the team leader from your area for further assistance if this equipment is not readily available. For the safety of patients, visitors and staff the use of personal electronic mobility aids such as scooters or electric wheelchairs must be operated in a safe manner.